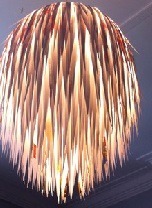 We are a lighting specialist company with over a decade of experience in the lighting industry. If you are looking for: ceiling lights, table lights, wall lights or garden lights we can help. Through our lighting showroom and website we can help you find the perfect solution to your lighting needs. Are the kids bored already? Want to pull them away from the screen? We have some inspiration for you! The popularity of the newly popular Loom Bands have been a resounding call that kids do want to get away from the screens and be creative. These are the top 5 DIY lighting craft projects we have found on our hunt around the internet – with a lot of help from Pinterest. This is a great project. I have always got plastic spoons littering the bottom of my drawers from parties in days gone past. If you do not have a bottle lying around, you can pick up a cheap bottle of fizzy drink, water or squash in your local shop for less that a pound. Worst case – This project will only cost you about a £5 from the local supermarket. If you want to get really inventive, you can buy other colours of plastic spoons off the internet! This is such an easy project. If you don’t have a paper shade in your house, they can be picked up really cheaply from local shops. For the scrap paper – you know all that junk mail that comes through your door? Save the space in your recycling bin and use it for this instead! This is a cut and stick project that looks fantastic! 3. 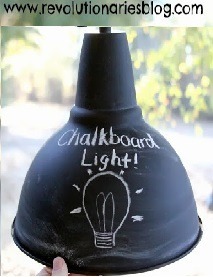 From Revolutionaries blog – Old and disliked pendant shade + Chalkboard paint + chalk = Awesome pendant. Do you have a pendant lamp hiding in the loft that you were going to throw out? Give it a new lease of life with this fantastic DIY idea. Chalk paint is really easy to buy from a local DIY store or online. Once it dries you can use chalk to design the pattern! You can get coloured sets really cheaply from your local craft stores. Because it’s chalk, you can change the pattern to suit the season – just make sure the light shade cooled down first! 4. From DIY Craft tutorials = Paper non-electric shade + Glitter + Spray on glue = Funky light. This is a really cheap and easy design idea. 5. From buzzfeed = Clear light bulbs + pack of sharpie pens. = Lamps that make fun patterns on the walls! This one is really simple and creates minimal mess (apart of cleaning the sharpie pens off your children). 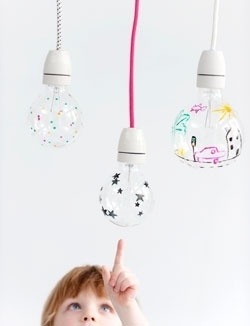 To do this project all you need to do is get your kids to draw pictures on the light bulbs, let it dry and then plug in! Just don’t forget to decide first if you’re putting it in the base of a table lamp of hanging from the ceiling. 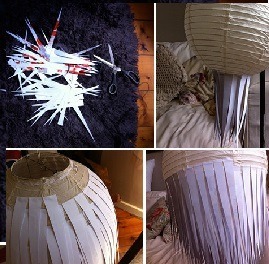 This can be a really fun project and - if you buy a few multi-packs of cheap lamps - will keep them amused for hours! Find more great home craft ideas go to our Pinterest board. Never miss a blog again: Subscribe now!